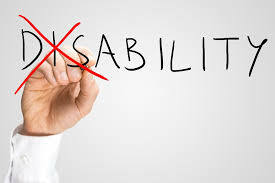 Ability, what is it and therefore what is disability? This question was posed to me during a training run this morning. I was trudging through the town centre and saw an empty large car with a blue badge displayed, double parked, engine left running in the zigzag markings of a pelican crossing with the driver drawing cash at the adjacent ATM. He was middle aged and had a shuffling walk. My immediate impression was of how selfish his behaviour was. Blocking half the carriageway, putting crossing users at risk and committing another offence, that of quitting. And I was a bit shocked that a disabled person should be so selfish. But then selfishness is not mutually exclusive to disability is it? But then the old boy needed his cash and was a bit wobbly walking. The very next impression I had was of a couple, like me out running. They were travelling at least one and a half times faster than I was. They were in their thirties and holding a conversation as they ran. IN SIGN LANGUAGE! So in comparison here was a guy utterly able to run at speed and sign with his partner causing no problems and making no demands on us or others safety. Brilliantly able. What an example for others who have their own trails to run and mountains to climb. I want to be able, like the signing runners and not disabled like the driver. It’s my choice. And it’s your choice too. Surrey Police’s December campaign to reduce drink and drug driving offences has proved a success with more than 70 people charged so far. During Operation Dragonfly the Force proactively named people that had been charged in a bid to raise awareness and highlight the dangers associated with getting behind the wheel when under the influence of drink or drugs. In the UK the Police Service and partners work very hard to keep us safe from the threat of guncrime. Firearms and weapons attacks are thankfully extremely rare, but we must always know to do stay safe. What would you do if you came under fire or heard gunshots at work or in public? Should you stay and hide, or run for the nearest exit? Would you know what to do to stay safe? Recently there was a statistic published and repeated on Twitter stating that complaints about drone use to the police had risen 2000 percent “Calls To Police Over Drone Privacy Up By 2,000%” via Sky News. The article and the statistic authored by Adele Robinson, Sky’s Midlands Correspondent is well researched but the debate moved into whether the Protection from Harassment Act 1997 would be available to reduce the complaints about drones invading your privacy. Well yes, in England and Wales this Act could be considered but it is probably not the first legislation the authorities might look to. This is because Section One of the Protection from Harassment Act 1997 states that a persons actions (with or without a drone) must amount to a course of conduct and that they know or ought to know that [their action] amounts to harassment. Some point out that CPS guidelines “to amount to harassment one must show a ‘course of conduct’ on 2 occasions within a year.” So the Harassment Act is not going to provide a swift solution notwithstanding the police could issue a warning to the offender. This being the case what other common or civil law might apply? Well while using a drone could ‘invade your privacy’ there is no specific law to protect your privacy, which point was reaffirmed when the House of Lords ruled in Home Office v Wainwright (a case involving a strip search undertaken on the plaintiff Alan Wainwright while visiting Armley prison). However there are many pro-social uses for drones including their use by Search and Rescue teams. Such teams are civilian volunteers who work closely with police, fire and rescue, other charities and the Ambulance services of the UK. Their primary role is to find vulnerable missing people. This often requires them to search open areas of rough land. You can see that drone use perhaps using an heat source recognising camera by Search and Rescue teams could reduce the area to be searched. My point here is that there are quasi-official uses for drones that might impinge on someones property or privacy but that most folk would accept this was a lawful or social purpose. The use of a drone in this case would be a mere fraction of the cost of powering up, let alone flying a police helicopter. And of course such use is strictly guided by policy, procedures and insurance. Fortunately there is legislation and guidance for all drone pilots not just the responsible ones which state you just need to have some common sense and safety rules. “Don’t fly near people, don’t fly over buildings, certainly don’t go near roads. Don’t fly over roads it’s just not sensible. At any moment your drone could drop out the sky, and no matter how much you prepare you need to be ready for that”. You need to fly responsibly. The CAA provide a “dronecode” telling users not to fly higher than 400ft, or near aircraft or airfields, and always keep eyes on the drone. The law also stipulates that drones fitted with cameras must not be flown within 50 metres of people, vehicles, buildings or structures, or over large gatherings. However there is a problem with antisocial drone use – that of the potential remote user. If something goes wrong they may merely walk away. but just how big is the problem Sky New has highlighted? A two thousand percent increase? Well Adele’s Freedom of Information figures show in 2013 officers recorded 19 calls compared to at least 461 in 2015 and in the last year the number rose by over 160%. Just half of police forces in England that Sky News contacted responded to the request. Considering the number of drones in use and the hours flown and number of complaints in the low thousands suggests this remains a generally small problem but one that should be monitored and brought back before the courts as drone use evolves. The Protection from Harassment Act 1997 is always available but I do not think it will feature often in cases of complaints about drone use.